Irregular Assignments and Vertex-Distinguishing Edge-Colorings of Graphs (M. Aigner et al.). Construction of Non-Isomorphic Regular Tournaments (A. Astie'-Vidal et al.). On Structures T(t,q,r,n) (W. Benz). A Tactical Decomposition for Incidence Structures (D. Betten, M. Braun). Note on a Characterization of Segre Variety in PG(r,q) (A. Bichara, S. Innamorati). A Property of Sharply 3-Transitive Finite Permutation Sets (A. Bonisoli, G. Korchmáros). Faithful Orbits in Symmetric Designs (A. Bowler). Minimal Flagtransitive Geometries (F. Buekenhout). Some Results on Hyperarchimedean MV-Algebras (V. Cavaccini, A. Lettieri). Three Combinatorial Sequences Derivable from the Lattice Path Counting (W. Chu). Compound Closed Chains in Circular Planar Nearrings (J.R. Clay). p-Primitive Semifield Planes (M. Cordero). The Fractal-Like Steiner Triple System (M.J. De Resmini). Locally Partial Geometries with Different Types of Residues (A. Del Fra et al.). (O,n)-Sets in a Generalized Quadrangle (A. Del Fra et al.). 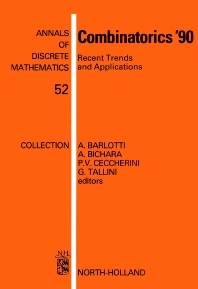 Combinatorics and Cryptography (F. Eugeni). Recent Intrinsic Characterizations of Ovoids and Elliptic Quadrics in PG(3,K) (G. Faina). A Natural Association of PGL(V)-Orbits in the Segre Variety (P(V))m with Flags and Young Tableaux (F. Gaeta). Decomposing Steiner Triple System into Four-Line Configurations (T.S. Griggs et al.). Non-Symmetric Configurations with Deficiencies 1 and 2 (H. Gropp). Characterizing Linear Spaces by Blocking Sets (E. Hahn). Partial Geometries of Rank n (D.R. Hughes). The Minimal Parabolic Geometry of the Conway Group Co1 is Simply Connected (A.A. Ivanov). Coset Enumeration in Groups and Constructions of Symmetric Designs (Z. Janko). On the Ubiquity of Denniston-Type Translation Ovals in Generalized André Planes (V. Jha, N.L. Johnson). Translation Planes and Related Combinatorial Structures (N.L. Johnson). Finite Reflexion Groups and their Corresponding Structures (H. Karzel). On Nonisomorphic BIBD with Identical Parameters (W.-F. Ke). Incidence Loops and their Geometry (M. Marchi). Families of Menon Difference Sets (D.B. Meisner). On the Characterization Problem for Finite Linear Spaces (N. Melone). Linear Spaces in which Every Line of Maximal Degree Meets Only Few Lines (K. Metsch). Flag-Transitive Buekenhout Geometries (A. Pasini, S. Yoshiara). Collineations of the Generalized Quadrangles Associated with q-Clans (S.E. Payne). Projective Embedding of Fibered Groups and the Suzuki Groups (S. Pianta). Codes, Block Designs, Frobenius Groups and Near-Rings (G.F. Pilz). The Flag-Transitive Affine Planes of Order 27 (A.R. Prince). Symmetric Functions and Bijective Identities (D. Senato, A. Venezia). On the Existence of Nearly Kirkman Systems (H. Shen). Codes and Semilinear Spaces (J. Simonis). Old and New Results on Spreads and Ovoids of Finite Classical Polar Spaces (J.A. Thas). Large Partial Parallel Classes in Steiner Systems (Z. Tuza). Minimal Line Distinguishing Colourings in Graphs (B.J. Wilson). Some Results on -1 Multiplier of Difference Lists (Q. Xiang). This volume forms a valuable source of information on recent developments in research in combinatorics, with special regard to the geometric point of view. Topics covered include: finite geometries (arcs, caps, special varieties in a Galois space; generalized quadrangles; Benz planes; foundation of geometry), partial geometries, Buekenhout geometries, transitive permutation sets, flat-transitive geometries, design theory, finite groups, near-rings and semifields, MV-algebras, coding theory, cryptography and graph theory in its geometric and design aspects.